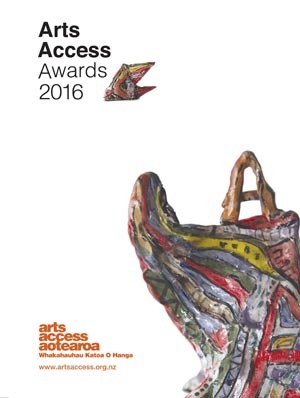 An artist who spent 12 years decorating the wharenui Te Poho o Hiraina in Gisborne, a community circus in central Auckland, partnerships providing artistic opportunities for Deaf and disabled people, and leadership in delivering arts programmes in prisons were recognised on Wednesday 10 August at the Arts Access Awards 2016, presented by Arts Access Aotearoa. 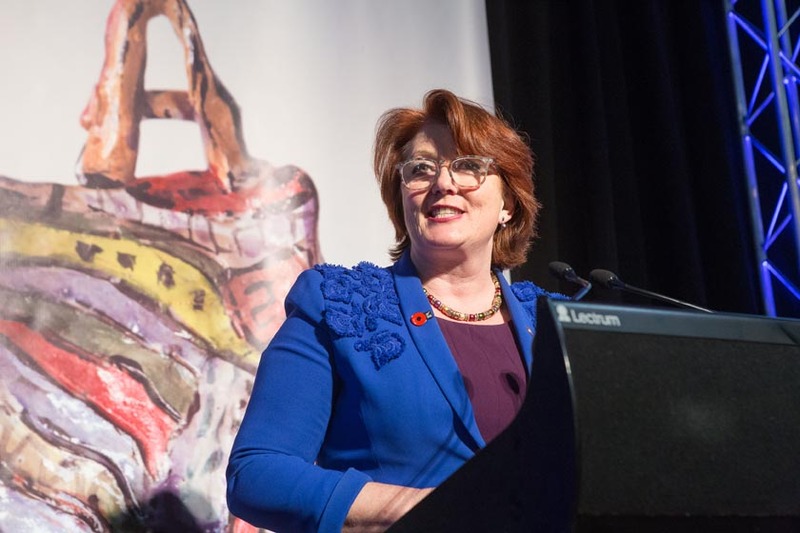 The Arts Access Awards 2016 were hosted by Hon Maggie Barry, Minister for Arts, Culture and Heritage, in the Banquet Hall of Parliament. This year’s Arts Access Accolade was presented to Glen McDonald, Coordinator of Vincents Art Workshop in Wellington, by Deputy Mayor Justin Lester. It recognises Glen’s life-long passion for creativity, community and inclusion, and her contribution to the Wellington community. This year, Arts Access Aotearoa introduced the Arts Access Media Award to acknowledge the media’s role in promoting a creative, inclusive society. This inaugural award was presented to Dionne Christian, Arts and Books Editor at the New Zealand Herald, to recognise leadership and excellence in reporting on accessibility and the arts. Circability Central, Central Auckland, awarded the Arts Access Creative Space Award 2016, for its diverse circus activities where all members of the community can gain new social and physical skills in an inclusive space. READ: Circability Central a "big happy family"
RoadSafe Hawke's Bay, awarded the Arts Access Corrections Community Award 2016, for its graphic design project with the Youth Unit in Hawke's Bay Regional Prison. Working with a graphic designer, young offenders decided to be part of the solution and create road safety resources that focused on changing people’s behaviour, attitudes and increase knowledge around road safety. Equal Voices Arts and partners University of Waikato, Deaf Aotearoa and Bill Hopkinson, Hamilton, awarded the Arts Access CQ Hotels Wellington Community Partnership Award 2016, for a partnership between Deaf and hearing communities resulting in a groundbreaking bilingual theatre work called Here At The End Of My Hands. Chamber Music New Zealand, Wellington, awarded the Arts Access Creative New Zealand Arts For All Award 2016, for its commitment to developing new audiences for chamber music through its accessibility programme. This includes audio described concerts for blind and partially sighted patrons, and workshops and relaxed concerts for people with intellectual disabilities. David Cameron, Gisborne, awarded the Arts Access Artistic Achievement Award 2016, for his outstanding achievements and contribution to traditional and contemporary Māori arts. . Paraplegic and a wheelchair user since 1977, David is a recognised leather worker, painter, ceramist and tutor in his preferred artform, uku (Māori clay ceramics). Northland Region Corrections Facility, Kaikohe, Northland, awarded the Arts Access Corrections Leadership Award, for the breadth of its achievements, its education outreach, innovative practice, and focus on the arts and culture as a tool supporting prisoners’ rehabilitation and reintegration into the community on release. Awhi Tautoko, Community Corrections, Whangarei, Arts Access Corrections Community Award 2016, for its grassroots programme that gives community-based offenders a way to express themselves and their world through art. Jolt Dance and Christchurch Symphony Orchestra, Arts Access CQ Hotels Wellington Community Partnership Award 2016 for a partnership that resulted in workshops and two performances, Shorelines (2014) and Fish (2015–2016). Arohata Prison, Tawa, Wellington, Arts Access Corrections Leadership Award, for its use of the arts as therapy and as a reintegration tool across all three units. Puna Tatari Special Treatment Unit, Spring Hill Corrections Facility, Te Kauwhata, Waikato, Arts Access Corrections Leadership Award, for its application of the arts and culture as an integral part of its psychological services and physical environment. Original generation time 1.3820 seconds. Cache Loaded in: 0.0898 seconds.